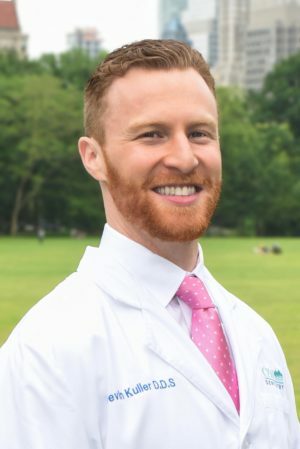 Dr. Devin Kuller earned his Bachelor of Science from Syracuse University, followed by his Doctorate in Dental Surgery from NYU. He was then accepted to the general practice residency program at the Wyckoff Heights Medical Center Department of Dental Medicine in Brooklyn. There, Dr. Kuller received the Resident of the Year Award and was asked to return for a second year as Chief Resident, winning the award once again. Dr. Kuller’s training focused on all aspects of dentistry, and he is particularly adept in the areas of restoration, cosmetics, and the treatment of children. Dr. Kuller has an easy-going, friendly nature that appeals to patients of all ages, especially those who are nervous. In his spare time, Dr. Kuller enjoys exercise, cooking, reading, and is an avid fan of the New York Giants and Rangers. Q: How do you want people to feel when they come to see you? A: I want them to feel at ease, and if I’m lucky, happy to see me. Q: If you could tell people one thing about dentistry or oral health, what would it be? A: I can read extraordinarily fast.